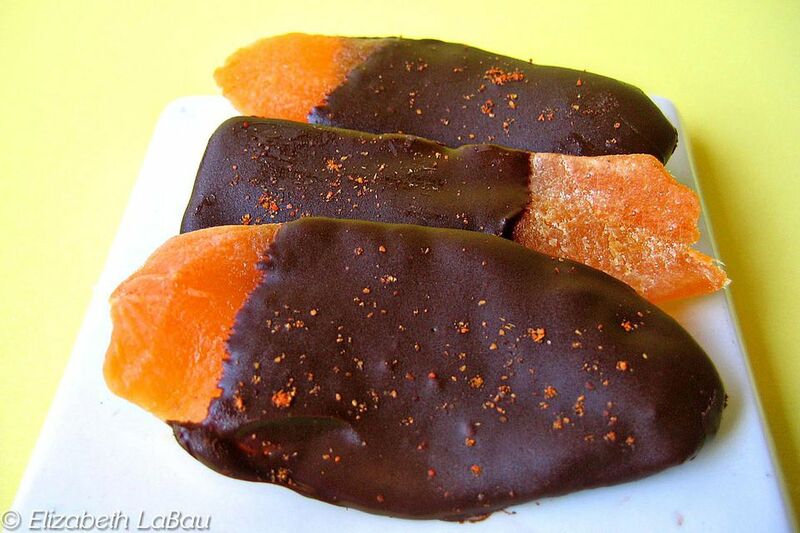 Flavorful dried mango is coated in bittersweet chocolate and dusted with spicy cayenne in this simple, delicious Chocolate-Dipped Mango candy recipe. The combination of sweet and chewy fruit, rich chocolate, and a touch of heat makes these mangoes truly special. Prepare a baking sheet by lining it with aluminum foil or waxed paper. If your dried mango is in large chunks, slice them into thinner "fingers" that will be easier to handle and eat. Place the chopped chocolate in a microwave-safe bowl and microwave until melted, stirring after every 30 seconds to prevent overheating. Once melted, stir until the chocolate is smooth. Allow it to cool for a few minutes and thicken up slightly. Hold a piece of dried mango by one end, and dip most of the mango spear into the melted chocolate, leaving only a small portion undipped. Remove the mango from the chocolate, and scrape the bottom against the lip of the bowl to remove the excess chocolate. Place the dipped mango slice on the prepared baking sheet. Repeat the dipping with the remaining mango slices and melted chocolate. While the chocolate is still wet, sprinkle the tops very lightly with a dusting of cayenne pepper. Place the baking tray in the refrigerator to set the chocolate, for about 20 minutes. Once set, the chocolate-dipped mango can be served immediately or stored in an airtight container in the refrigerator for up to a week. Note: Because this recipe uses regular chocolate that is not tempered, the chocolate will get soft when exposed to high temperatures for extended periods. To prevent this, you can temper the chocolate, or use chocolate candy coating. Click Here to View All Candy Recipes with Dried Fruit!